How do you get onto the front page of the the Sunday Tennessean? 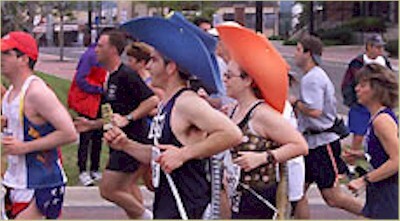 You run a marathon and wear big floppy hats. This photo made it to page one today with the following caption, "Huge cowboy hats top off Tom and Sue Linger's [sic] running outfits." I'm not too worried about the misspelling, because I noticed that the Country Music Marathon's website has results for two categories of runners: male and femail. Tom, Sue, and Amy drove all the way to Nashville to run 26.2 miles yesterday. Today I went with Scott to his back-to-back basketball games. He scored 5 and 8 points in his team's 27-35 and 27-53 point losses, respectively. Matt went to a movie, as he often does on Sunday afternoons, with some of his friends.